This Essa Single-Handle Pull-Down Sprayer Kitchen Faucet in Arctic Stainless with MagnaTite Docking features a soft contemporary take on a euro design, with contemporary and transitional elements. The pull-down spray wand comes free with a gentle tug and gives you total flexibility. The hose extends and retracts without friction points, fed by gravity. As you raise the wand to dock it, the magnet embedded in the spout pulls the wand precisely into place. So, unlike other pull-downs that tend to droop over time, MagnaTite. keeps your pull-down faucet looking picture-perfect. Delta's exclusive DIAMOND Seal. Technology uses a valve with a tough diamond coating. InnoFlex. PEX waterways keep water inside the faucet out of contact with potential metal contaminants. This powerful combination brings you a faucet built to last up to five million uses. Striking the perfect balance between form and function, the Struct gourmet faucet adds an unmistakably bold statement of confidence to any smart interior. 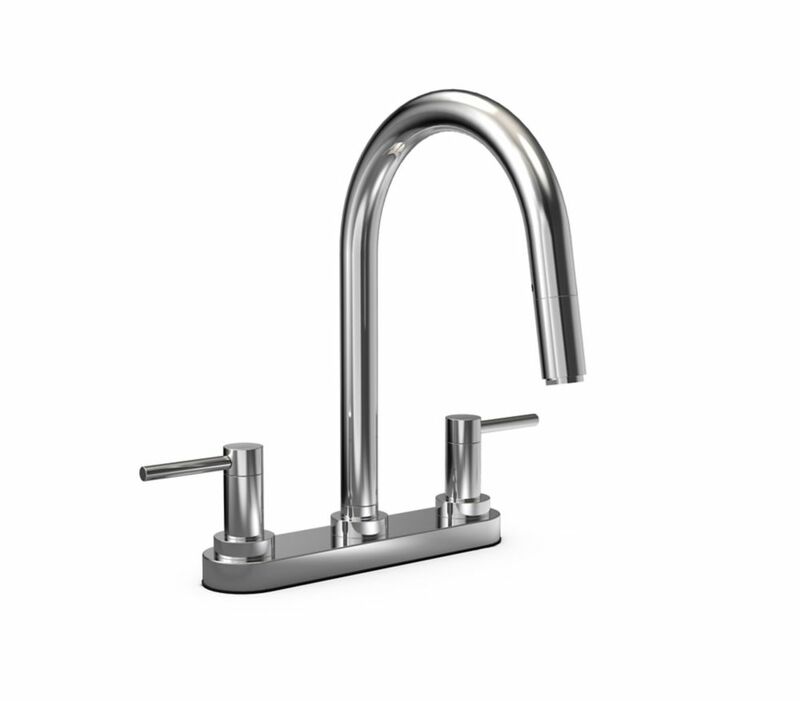 The spring-design spout and spray wand lends the Struct gourmet kitchen faucet its characteristic industrial style. The sprayer easily undocks from the swing arm and provides total flexibility. There is also a toggle switch so you can choose between stream and spray mode. The unique integrated pull-down wand feature lends the Trinsic Pro kitchen faucet collection its characteristic style as well as unrivaled functionality. The Trinsic Pro faucet puts control in the hands of the user with the flexible, spring-design undocking spout, which can be easily disconnected then magnetically re-docked for free range of motion. When docked, the Trinsic Pro faucet still operates as a true pull-down faucet with MagnaTite Docking. Thoughtfully designed to make kitchen tasks easier, Touch2O Technology allows you to turn the faucet on and off with just a touch anywhere on the faucet's spout or handle. Designed for precise, responsive control every time, no matter where you touch. You can easily control and change the water temperature above the deck using the faucet handle. TempSense Technology measures the water temperature in the faucet. The LED light at the base of the faucet changes from blue to magenta to red depending upon the temperature of the water. Moderno 2-Handle Pull-Down Kitchen Faucet - Chrome Kitchen faucet, modern style, in chrome finish from the Moderno collection. This 2-handle faucet is made of solid brass and has a 1-function spray. It can be installed on a 3-hole sink. Moderno 2-Handle Pull-Down Kitchen Faucet - Chrome is rated 5.0 out of 5 by 1. Rated 5 out of 5 by Calgary oldie from Two handle ‘pull down’ hard to find ... Glad I was persistent. I love it! Nice and sleek and modern looking, easy to clean and an amateur installed it. Great buy.